Authors: Moriah Thompson, M.D., Rachel Lindor, M.D. and Meghana Helder, M.D. Classic, although not typical findings: distended neck veins, hypotension, diminished or absent breath sounds, and tracheal deviation. Most commonly presents with signs of respiratory or hemodynamic compromise. 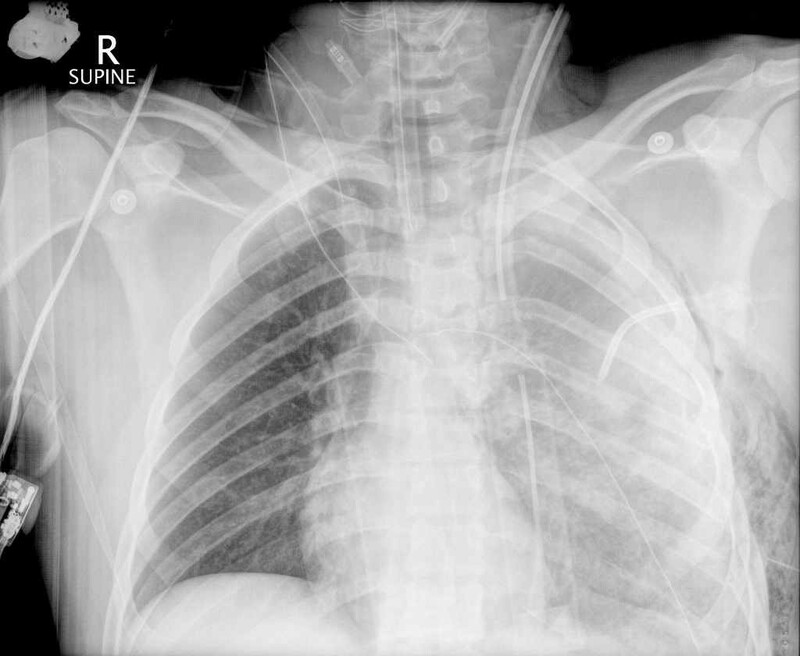 Respiratory failure common, treat with early intubation and ventilator assistance. 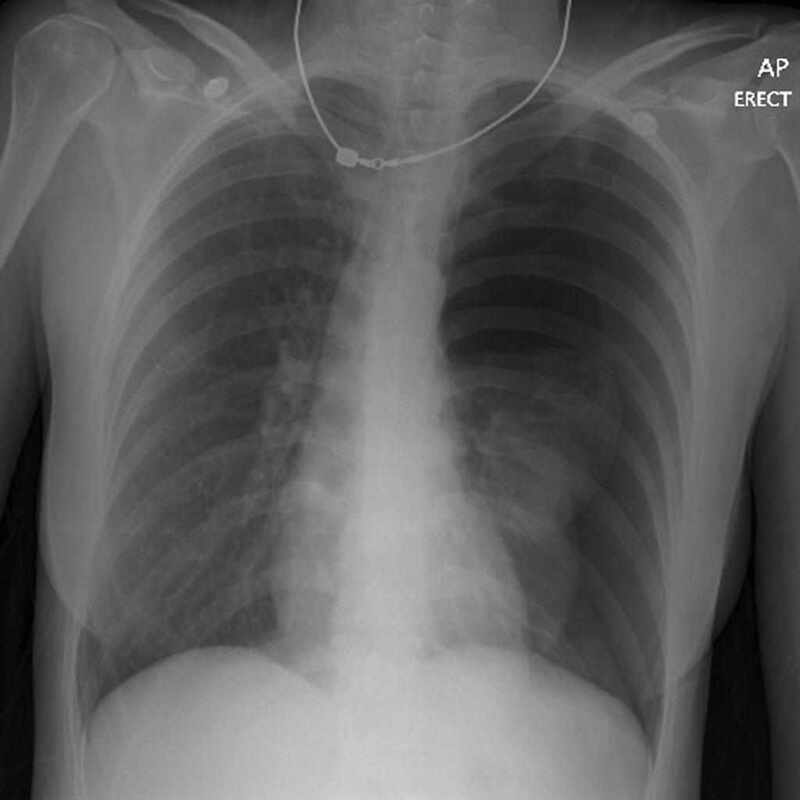 Patchy ground-glass opacities on CXR or CT or widespread consolidation in severe cases. Thin walled atria higher risk for rupture than thicker ventricles. Shayn, Martin, and Meredith Wayne. "Management of Acute Trauma." Sabiston Textbook of Surgery. 19th ed. Vol. 1. Philadelphia, PA: Saunders, an Imprint of Elsevier, 2012. 430-470. Print. Brunett, Patrick, Lalena Yarris, and Arif Alper Cevik. "Pulmonary Trauma." Tintinalli's Emergency Medicine: A Comprehensive Study Guide. 7th ed. Vol. 1. New York, NY: McGraw-Hill, 2011. 1744-1757. Print. Ross, Christopher, and Theresa Schwab. "Cardiac Trauma." Tintinalli's Emergency Medicine: A Comprehensive Study Guide. 7th ed. Vol. 1. New York, NY: McGraw-Hill, 2011. 1758-1764. Print.